Hey. I am over at Whip Up again today--Kathreen invited me to come on over for another round of guest blogging and tutorial-sharing--she's crazy like that (which I only mean in the nicest way because how can you not love the woman behind the genius of Whip Up, my personal one-stop-shop for all the best craftiness going on in blogland). 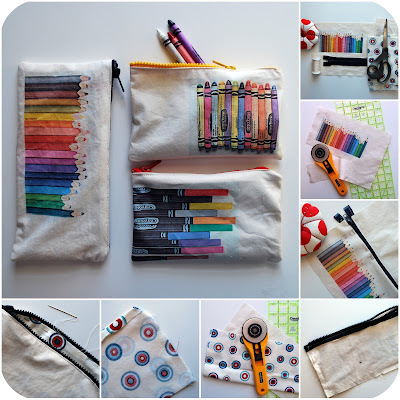 And in case you were wondering what I am up to over there, well, it is a little tutorial on how to make an art supply pouch--I know there are no shortage of tutorials already out there on making pouches, but I had my own reasons for creating theses specific pouches with the printed images of their art supply contents--which you can read more about over at Whip Up when you finally get around to going there. Also, I just want you to know that putting together this little project involved me learning to create my own printable fabric sheets using Bubble Jet Set (and their recommended rinse), as well as some precut freezer paper (but you could cut your own if you are more industrious than me)--and as a result I am a now a life-long believer in making your own printable fabric sheets, people. 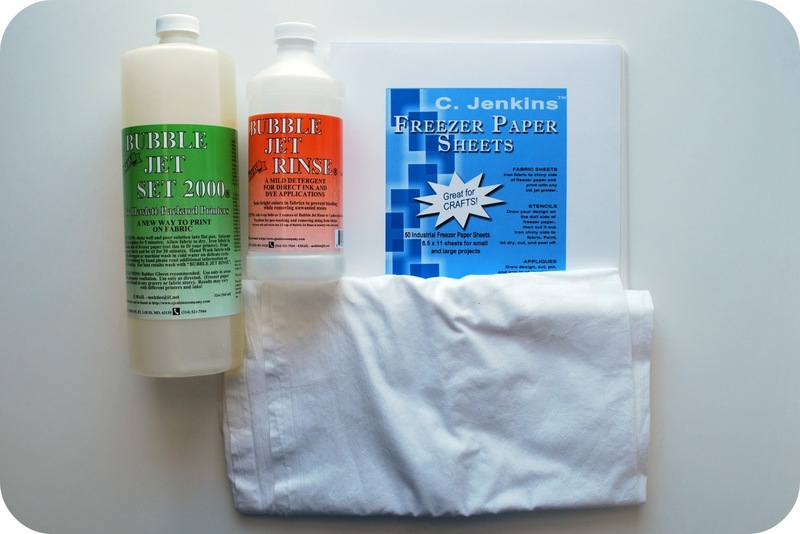 It is pretty simple, way more cost-effective, and the quality of the homemade sheets beats all others hands down (and I have tried many--but if you really want to purchase some ready-made, the best quality can be found here, in my opinion)--so that is just my personal plug on that crafting front, even without any sponsorship from Bubble Jet Set (although if they want to send me more of their product I will gladly accept and find good use for it--how shameless was that?). Anyway, I offer several variations on the pouch (some above, but even more over at Whip Up) for those amongst you fearful of inserting zippers, or for those who might find a drawstring bag more to your liking. I would also mention that if you want to create a pouch, but are just not in the mood to go through the additional step of taking photos of your art supplies to print on the fabric--well you are in luck because I have uploaded my own art supply photos to my Flickr account and you can download them for your own fabric printing, right here. See? I'm nice and I can share (even if I do pander for free products). So, c'mon on over to Whip Up and download the tutorial in my usual PDF format--you can find me here. I am so curious, how does the fabric feel/look after this treatment? Is it like the original? stiffened? gluey? shiny? I love how it turned out and it was totally worth the money for my good friend but I'm not gonna lie, it was a little spendy. 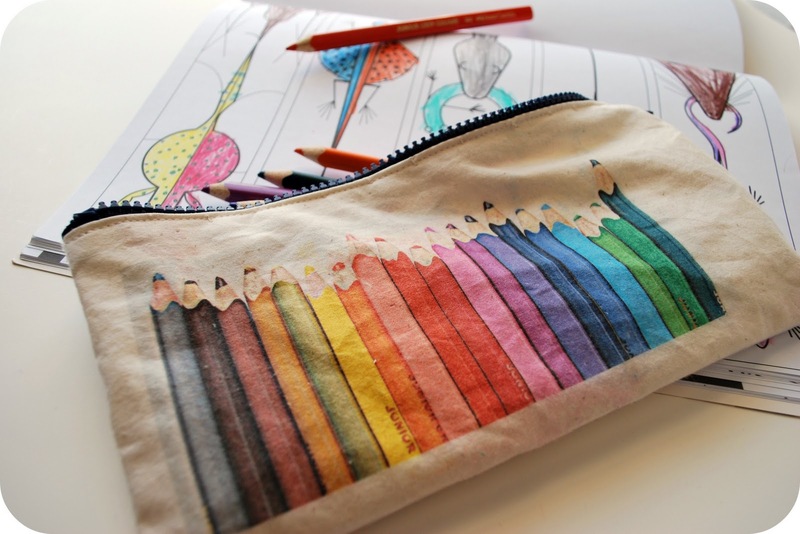 I didn't know you could make your own printable fabric, that's amazing. Thanks for the info, the pouches are so pleasant! Steph--I already saw your project as part of Rae's Boy month--it was pretty rad. Really. I was impressed--and those of you who have not seen Steph's work should go check it out because it is nice. This is wonderful. I'll have to add this to my to-do list. We have many art aficionados in our house. Thank you. not nice !! Very very very nice !!!!!!! Great idea !!!! Ahhhhh...printables! SUCH a great idea! 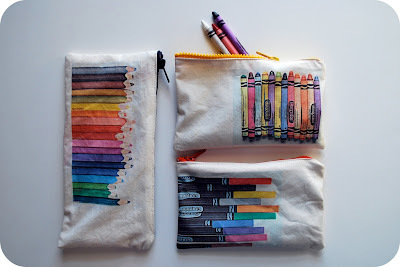 I just did a round of pouches for storing treasures for the Munchkins earlier this week... But I might have to do a slew more just so I can try printing on fabric too. Thank you! super crazy awesome! I feel like I say this about all your projects, but really they all are. Oh my goodness I love these! I hope you don't mind that I put a picture (with a link) on my blog here: http://annabelvita.com/did-you-know - i tried doing it without a picture but it quite convey how awesome these are. Annabel--totally fine by me to use my photo--as long as you credit it and link back to me. And thanks for sharing it. The Art Teacher--thanks for sharing it on your blog. I went and took a peek at your blog--your art projects are wonderful and inspirational. Super super super cute! Thanks so much for the images too! Thanks for your beautiful tutorial. The project came out awesome. I was wondering about the process of making your own printable fabric sheets. I believe you when you say they're superior (and I hope you get some free swag!) but I am hesitant because I am unsure about the process. Any chance you'd give us a quick tutorial on making them? Twobadmice: I could make a tutorial but I really do not think you need it because the bottle of the products you use give all the directions you need. It is pretty simple anyway--cut your fabric to printing size (cut them just slightly smaller than the freezer paper you will adhere them to later--or they may jam in the printer), soak in the jetset solution, remove and air dry (do not wring or you will wrinkles that will never really go away--I made this mistake), iron them to the freezer paper and print (allow to dry for a couple of hours after printing before the next step), rinse them in the rinse product as instructed, again allow to air dry, and then voila! printed fabric. Amy Karol also fully outlines how to do this in her book, Bend the Rules with Fabric if you want something with photos and printed--plus there is a whole lot more good stuff in there. You could also just print these as some iron on transfers--it won't be quite the same as they will be shiny and rubbery, but it will be easier. Thank you so much for talking me though it. It is super kind of you. I have that book too so I think I will take the plunge and order some supplies. Again- thank you for your quick generous response! I love it! Off to make some as soon as i can get this printer to work.I didn't know you can make your own printable fabric.I have been a long time fan of your blog and find it really inspiring. WOW. Amazing idea - and it's so cool that you can make your own printable paper. I've def had trouble with some of the ones i've bought before, so next time i need them I'll give making them a try!